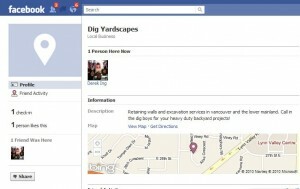 Facebook Places was launched in Canada a few weeks back. If you’re a small business that relies on your local community, this is another way you can get your local on. And since it’s so new, there’s a good chance that your competitors have not jumped on the bandwagon yet. Why not lead the way? It works much like the popular location application, Foursquare. People can check into locations through their iPhone Facebook app. Should your small business claim a Facebook Places page? Facebook Places allows you to promote and share specials sales or promotions, or an event that you are having. You can also offer coupons or discounts to your customers that check into your location. A VERY powerful marketing tool! If this has you salivating at the opportunities, check out this post for 7 Strategies for Making the Most of Facebook Places. * Don’t forget to include signage around your establishment encouraging customers to check in. Let them know the benefits of doing so. If your location in a certain town is relevant to your business (ie. You only do business in a specific city or area) and your customers find your website through local search (ie. Your keyword plus a city), absolutely go for it! So, while people won’t be checking in, Facebook Places will help to reinforce the city you work in and give Google and other search engines another nudge about what you do and most importantly, WHERE. Then it’s up to you. If you want another link to your website and a chance to put a keyword loaded company profile for SEO purposes, go right ahead. There’s no harm in claiming and “owning” your Facebook Place page, so to speak. This way you have control over it, but you don’t have to use it if there is no value in it for you. But, if you have avoided sharing your location in your biz, and think there could be negative repercussions to doing so, such a confusing your customers, then skip it. Requirements: an iPhone with the latest Facebook app. If you can’t see the Facebook Places icon on your iPhone, you must download the latest version of the Facebook app. Only takes a couple of seconds. Well, I just got an email from Facebook and it seems that they want to see proof of business ownership before they approve a Place Page. When I was setting up the page for my client, all Facebook asked for was an email confirmation, where the email had to be from the URL of the company website. Which I thought was a very reasonable process to authenticate a business. Providing a copy of business ownership documentation on the other hand, well that is information that I personally would not be comfortable sharing with Facebook. I’ve seen online that lots of people are having trouble with this.